Dreams, dreams, dreams. Los Angeles, California is the place people go to achieve their dreams. However, it is also the place where many a dream unfortunately go to die. 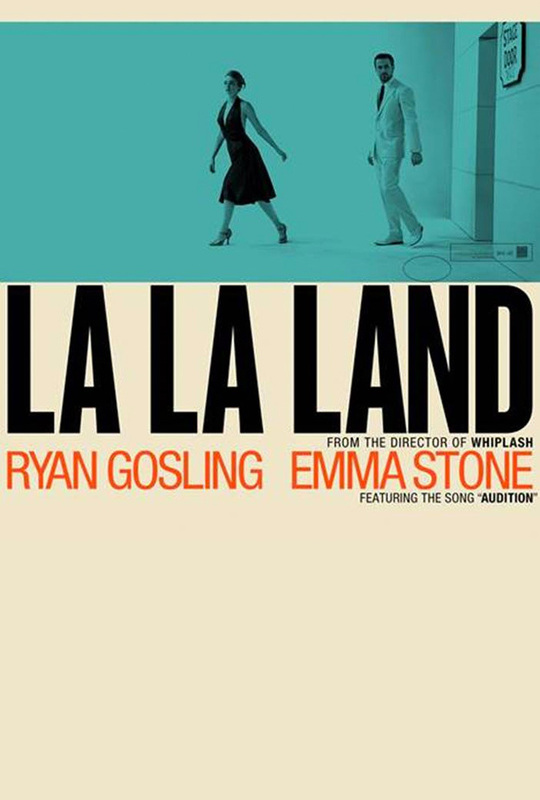 For aspiring actress Mia (Emma Stone), and old-school jazz pianist Sebastian (Ryan Gosling), only failed auditions and small-bit gigs have come from their hard work. Both do not have much more effort to give to their aspirations. But, their batteries are recharged after chance run-ins continue to bring them together. Romance arises out of it. And luck actually begins to change for both of them. Their careers appear ready to take off, but the relationship they’ve built together could be undone if so. Much like Hail, Caesar!, La Land Land is a love letter to something particular. Whereas the former film was a love letter to old Hollywood, the latter film is much more specific in its scope, writing a letter to a particular genre of film. That genre of film being the musical. Its simplicity and uncommon-ness in today’s day and movie age makes for a fascinating and fresh watch. 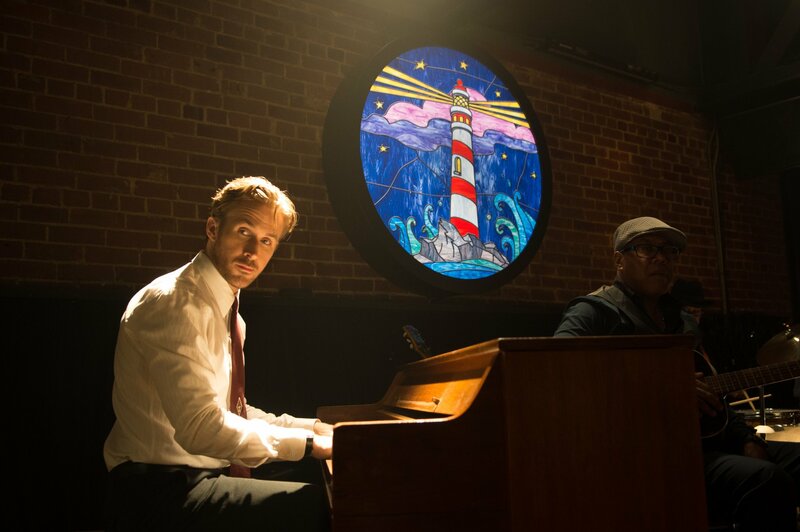 Yours truly never looks forward to watching a musical, and I was a little skeptical of La La Land for this very reason initially. My skepticism was put to bed rather quickly, as director Damien Chazelle (Whiplash) opens the movie with an astonishing set piece on the actual LA freeway. What Chazelle does here is simply amazing. The music happens rather organically, rather than overly manufactured. Though the pieces become significantly smaller scale-wise as the film progresses, that doesn’t make them any less impressive. In fact, it allows the cinematography to shine brighter, making for a beautiful-looking movie. This obviously isn’t a three-dimensional feature, but it pops a lot more than most do. It’s impossible not to appreciate all of the technical hard work and cinematic skill that’s on display. Underrated aspect of the movie? Cool to see the City of Angels not as a dunghole of despair, but—ahem—a beacon of hope and opportunity. But, La La Land isn’t purely a musical. It is basic romance between two characters that initially start at odds, the common backbone for many a film. He also takes stabs at a few themes that hit emotionally, mainly the idea of taking destiny in one’s own hands and the internal fight an individual has with remaining true to their artistic values, versus cashing in and providing stability. Chazelle also wisely veers away from falling into overly cheesy mode or the happy Hollywood ending, and it gives more credence to the story. Perhaps 10-15 minutes could have been trimmed off in the middle, but otherwise, the film moves at a brisk pace, and an engaging musical number is seemingly right around the corner when things ever so slightly bog down. I like to believe that the strongest romantic on-screen chemistry between stars makes a viewer believe that off-screen, the two could easily be an item that plasters the front pages of the tabloids and leads the E! nightly news. 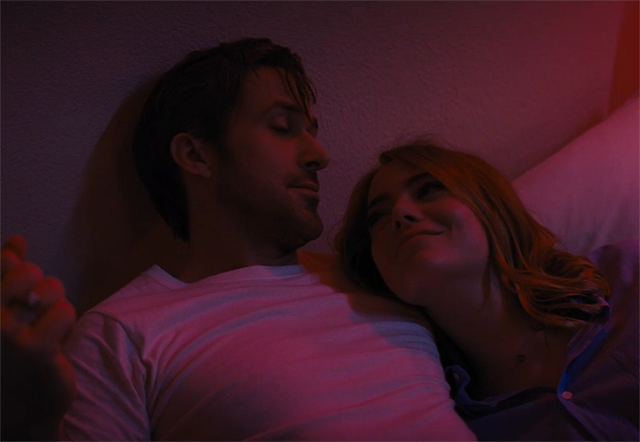 Emma Stone and Ryan Gosling have that kind of chemistry, surely cultivated from previous movies, scintillating from the initial crude beginning on the freeway to the touching ending. Neither is classically trained in the art of song and dance, but their commitment is evident. These aren’t easy roles to nail even with extensive research or hours upon hours of practice. It speaks to the raw skill that each person has that their performances come off pretty effortless. Sound and unmemorable work is turned in by supporting castmates John Legend, J.K. Simmons (pretty much a cameo), and Rosemarie DeWitt, but they do their jobs. Their roles aren’t written to be meaty, just to provide more meat to the characters Gosling and Stone occupy. Outside of Stone, Gosling, and Chazelle, the biggest star of the film is the unseen choreographer Mandy Moore (to my surprise not the singer). If Chazelle wins Best Director, Moore’s got to be right beside him or mentioned at the top of the acceptance speech. Liking the musical genre does not need to be a prerequisite for appreciating La La Land. To qualify it as only a musical would be a disservice to it. There’s more than enough in this particular number for anyone who just likes film. Photo credits go to reddit.com, ew.com, comingsoon.net, and popsugar.com. This is my favorite movie this year. It’s up there for me. I hate doing lists (because I never see everything I want to before the year’s over), but I’d put it at around 5 or 6. I’m getting more and more nostalgic for this movie the more days that are put between now and when I saw it. I didn’t give it a perfect score but that was only because I thought Chazelle didn’t really advance or do anything new with the themes he previously explored through Whiplash, which in my feckin’ humble opinion provided nothing short of an adrenaline rush while begging us to examine where we should or might draw the line between acceptable sacrifice and unacceptable sacrifice. If you want to put it into a word, I guess I would say La La Land is “softer” in its themes but it’s not really any less compelling or powerful. Those performances are really magical and some of the music is just awesome. And this is the part where I say I’ve still never seen Whiplash smh…I know I know, that has to change! I can’t lean towards perfect either, but it is impossible to not get entranced by this film’s beauty, acting prowess, and technical merits. And again, I typically musicals but the music was great and it felt like it happened organically. Fine review. Prior to posting my Top 10 of 2016 I had to do some serious rethinking. I had it down in my mind but then I saw La La Land and I immediately had to alter the list. It really left an impression. I agree. For a guy who doesn’t really care much for musicals (granted this traverses a few genres but is still mostly a musical), I pretty much loved this. Cracking review sir; I’m awaiting this with baited breath here in the UK. I think you’re gonna love it Mark. It truly is one of the best of 2016, and an all-time great musical.